A client of mine (let’s call her Sara) completed one of my online courses, but she still felt she needed a little more work on her voice. Then after completing a six-session coaching program, she said she’d finally found the voice that matches her feminine essence. Sara teared-up in our final session together, explaining that there had been many, many occasions that she feared for her safety because her voice outed her every time. Now, she said, she felt free. She no longer feared going to the places where her daily activities took her. Image a voice that not only expresses who you really are, but gives you the confidence to live your life freely. Stories like this are what inspired Eva. Most visions, which come to fruition, do so through a series of serendipitous circumstances. In 2011, I was involved with a creative women’s group where I was challenged to look beyond my limitations and focus my creative energy on something that would really make a difference in the world. Later that year, a former client of–now the co-founder and co-creator of Eva, Annika Kappenstein–mentioned that my training programs were scattered all over the place and, that they ought to be combined into a single technology, a mobile app. Remember, it’s been less than10 years since most of us ever even thought of such a thing–a mobile app. The first iPhone, and thus the first mobile app, were released in June 2007. Now, there are nearly 2 billion smartphone users and over 3 million apps available for sale (Google Play and iTunes) worldwide. Since we scarcely take our eyes away from our phones, Annika and I thought, “Well, let’s train them where they are–connected to their mobile devices.” The right people came together, we secured our first round of investment capital, and we got to work. Eva made her world debut on April 13, 2013. Then, we hit a few snags and development slowed (oy vey), then just this past June (2015) Eva 2.0 was released. Now, all the lessons are provided to you in a single app. We’ve included two new lessons, a free sample lesson and a free pitch tuner. 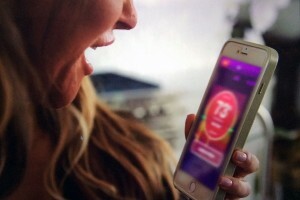 Search Eva MtF in the Apple App Store. Eva is a perfect blend of science, technology and sensibility. There are a several very good software programs, which provide the objective data for these elements and, in fact, one of them was my inspiration for the tools we’re developing for Eva. The Pitch Tuner for Eva 2.0 is now active and we are hard at work developing the Resonance Analyzer using our proprietary algorithms, designs and coding. 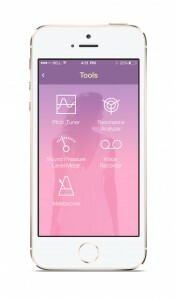 This tool will help you make the micro-motor movements in your mouth and throat that will re-shape your vocal tract so the resonant tone of your voice has the feminine quality you want. The balance of the training tools will be available soon. At this time, we are developing for iOS only. This platform proved ideal for our unique algorithms. We will build out the Android platform at a later date. We do not have plans to develop for MS mobile devices. One of the questions we often receive asks if Eva will work on a laptop or desktop computer. No, Eva’s (MtF and FtM) voice training programs are developed for mobile technology (smartphones and tablets), and thus are not compatible with laptop or desktop computers. Eva. Giving Everyone a Voice! We appreciate our early adopters who have worked with Eva from the beginning and have willingly provided your feedback and suggestions. We do understand that there have been some download issues, confusion about how to find Eva in iTunes, and complaints about why Eva is not available on more Android devices. We are working to perfect the functionality and user experience. The simple truth is, we’re working with a tiny budget. We attempted to secure more robust investment capital, but angel investors turned us down. I guess they couldn’t hold our vision of saving the lives of transgender people. We here at Team Eva are asking you, our users, for help. In order for this innovative technology to mature into its greatest version, we need a few things from you. Please share this information about Eva with a friend, your physician, your therapist and others in your support group. 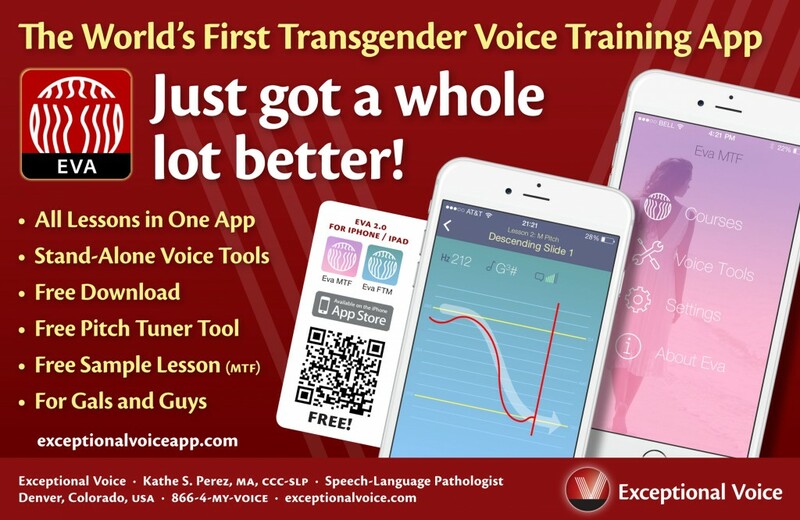 Eva is a voice training system for MtF and FtM transgender people. When complete, Eva MtF will have three courses (with multiple individual lessons) tailored to the developmental level of one’s voice. Eva FtM will consist of a single course (10 lessons). Eva MtF now has seven lessons available for the beginner’s course, Voice Feminization Fundamentals. When complete, Course 1 will have 20 lessons. We are now developing a revolutionary resonance analyzer, which should be available near the end of 2015. We are developing only for iOS devices for now. The Android platform has many issues for our complicated voice analysis algorithms. Enriching the human experience one voice at a time. 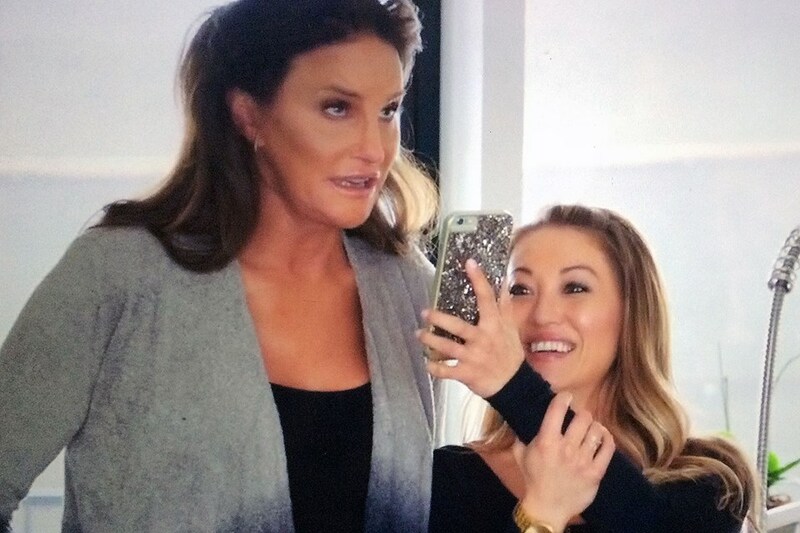 Oh, and Caitlyn Jenner­–on her show I am Cait–was shown interacting with Eva (S1/Ep02)! Go Caitlyn! We support you! IMPORTANT: Do not re-purchase the apps you may already have for Eva 1.0. These early apps were not updated. Those apps will NOT migrate to Eva 2.0. You can continue to work with those lessons on your device and switch to Eva 2.0 to work with the new lessons and tools. Thank you for your support and patience. We are here together as a community to raise each of us up to become who we really are! Kathe Perez is a certified speech-language pathologist and an internationally recognized expert in the area of transgender voice training. She is co-founder and co-creator of Eva, the world’s first transgender voice-training mobile app. To find out more about Kathe and her voice training programs, go to: www.30daycrashcourse.com, www.youtube.com/user/tgvoice, www.exceptionalvoice.com. Find out about the newly released program, feminEssence: A Guided Meditation for Your Feminine Voice (www.feminessence.com). Contact Kathe directly at info@exceptionalvoice.com or 866.4.my.voice.